How is voting in special benefits for themselves first, while the rest of us are left in legislative limbo, consistent with securing "the Blessings of Liberty to ourselves and our Posterity"? Allow all Members of Congress to have the ability to attempt to qualify for a concealed carry permit - either through their home state or a training program created by the United States Capitol Police (USCP). Give the USCP the discretion in determining the training, licensing and parameters of use. Direct the USCP to grant Members of Congress the ability to concealed carry in nearly every conceivable scenario - including federal parks and buildings, the national mall, to and from their offices, at schools and military bases - with only a few limited restrictions. These would include National Special Security Events, other areas under the direct jurisdiction of the Secret Service and commercial airliners. Permit the training and certification to be paid for out of the Member's Representational Allowance (MRA). Supersede any other federal or state law regarding concealed carry. 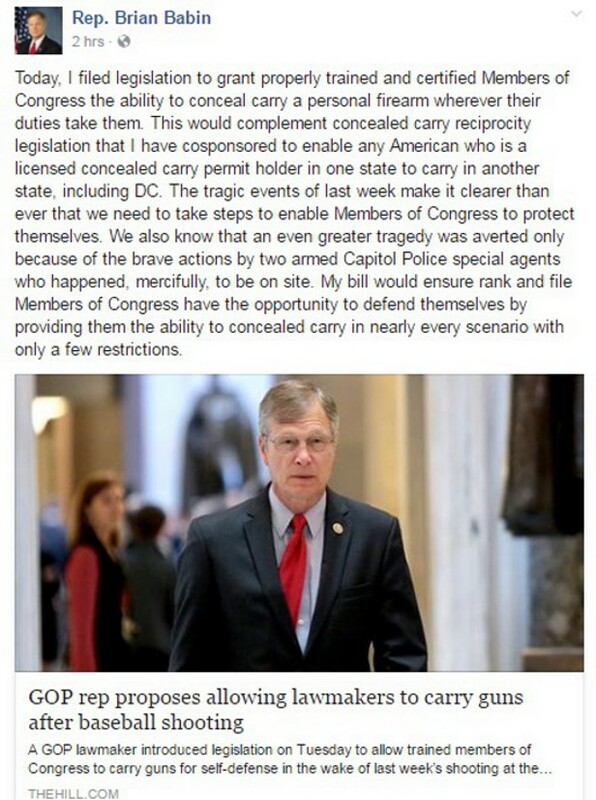 "My bill would ensure rank and file Members of Congress have the opportunity to defend themselves by providing them the ability to concealed carry in nearly every scenario with only a few restrictions," Babin elaborated. "With the increase in security threats to Members of Congress and our staffs, this is an important and necessary step that we must take." As if Congressional disregard for the limitations required by the Constitution and supposedly unalienable rights of the citizenry haven't increased security threats for all. While politicians no doubt face job-related risks, there is no credible justification for presuming their perils are any greater than - or even equal to - those faced by pizza delivery drivers, fast food workers or gas station mini-mart attendants, let alone the dangers presented to ordinary people living their daily lives. Babin's offensive and un-American equal protection-eviscerating scheme puts similar Congressional Carry proposals offered since the baseball practice shooting of Rep. Steve Scalise on steroids, as recent news reports show.